Abstract：A preliminary study based on the breeding ecology of red-winged laughingthrush (Trochalopteron formosum) was conducted during the breeding seasons from 2014 to 2016 in Laojunshan National Nature Reserve, Pingshan county, Sichuan province, China. The results showed that the breeding period of T. formosum was from late April to mid-September. In 2016, the breeding population density was 14.733 ind./km2 (95% confidence interval:11.727-18.511|coefficient of variation:0.115). Nests were found mainly in bamboo (Chimonobambusa szechuanensis). In addition, the female laid an egg in the morning during the egg-laying period, and the average clutch size was 2.28 eggs±0.09 eggs (n=24, range=2-3 eggs). The incubation period was 14-15 days, and the hatching rate was about 59.6%. The nestling period was 14 days, and the fledging rate was about 50.0%. Nest predation was the primary factor causing breeding failure of T. formosum. The species preferred nest-sites with less arbor and more tall bamboo, and the coverage of trees might be the key factor affecting the nest-site selection of T. formosum. 丁长青, 郑光美. 1997. 黄腹角雉的巢址选择[J]. 动物学报, 43(1):27-33. 付义强, 张正旺, 陈本平, 等. 2010. 四川省老君山自然保护区棕噪鹛和丽色噪鹛繁殖巢的记述[J]. 四川动物, 29(3):488. 付义强, 张正旺, 陈本平, 等. 2011. 四川老君山自然保护区红翅噪鹛冬季栖息地特征[J]. 动物学杂志, 46(5):48-54. 蒋迎昕, 朱永智, 孙悦华. 2007. 甘肃卓尼橙翅噪鹛繁殖生态报道[J]. 四川动物, 26(3):555-556. 廖为明, 洪元华, 俞社保, 等. 2007. 婺源黄喉噪鹛繁殖生态及其与村落风水林关系研究[J]. 江西农业大学学报, 29(5):837-850. 吴丽荣. 2005. 山西芦芽山自然保护区山噪鹛的生态观察[J]. 四川动物, 24(4):594-595. 杨杰, 张秀雷, 陆钢, 等. 2007. 四川老君山自然保护区不同生境鸟类多样性研究[J]. 四川动物, 26(4):760-763. 杨维康, 钟文勤, 高行宜. 2000. 鸟类栖息地选择研究进展[J]. 干旱区研究, 17(3):71-78. 约翰·马敬能, 卡伦·菲利普斯, 何芬奇. 2000. 中国鸟类野外手册[M]. 长沙:湖南教育出版社. 张正旺, 郑光美, 杨向明, 等. 1997. 褐马鸡的窝卵数及其变异[J]. 动物学报(s1):84-87. 赵亮. 2005. 繁殖期两种百灵科鸟类对捕食风险的行为响应[J]. 动物学研究, 26(2):113-117. 郑光美. 2004. 中国濒危雉类生态学研究进展[J]. 生物学通报, 39(1):1-3. Anderson DR, Burnham KP, Thompson WL. 2000. Null hypothesis testing:problems, prevalence, and an alternative[J]. Journal of Wildlife Management, 64(4):912-923. Bell G. 1980. The costs of reproduction and their consequences[J]. American Naturalist, 116(1):45-76. Burnham KP, Anderson DR. 2002. Model selection and multi-model inference:a practical information-theoretic approach (2nd edition)[M]. New York:Springer-Verlag. Clements JF. 2007. The Clements checklist of birds of the world, 6th edition[M]. Ithaca, New York:Cornell University Press. Dinsmore SJ, White GC, Knopf FL. 2002. Advanced techniques for modeling avian nest survival[J]. Ecology, 83(12):3476-3488. Duren KR, Buler JJ, Jones W, et al. 2011. An improved multi-scale approach to modeling habitat occupancy of northern bobwhite[J]. Journal of Wildlife Management, 75(8):1700-1709. Elphick CS, Reed JM, Delehanty DJ. 2007. Applications of reproductive biology to bird conservation and population management[M]//Jamieson BGM. Reproductive biology and phylogeny of birds (Aves). New Hampshire:Science Publishers:367-399. Ferretti V, Llambias PE, Martin TE. 2005. Life-history variation of a neotropical thrush challenges food limitation theory[J]. Proceedings of the Royal Society B:Biological Sciences, 272(1564):769-773. Fontaine JJ, Martin TE. 2006. Parent birds assess nest predation risk and adjust their reproductive strategies[J]. Ecology Letters, 9(4):428-434. Fu YQ, Chen BP, Dowell SD, et al. 2016. Nest predators, nest-site selection and nest success of the Emei Shan liocichla (Liocichla omeiensis), a vulnerable babbler endemic to southwestern China[J]. Avian Research, 7(3):161-166. Fu YQ, Dowell SD, Zhang ZW. 2011. 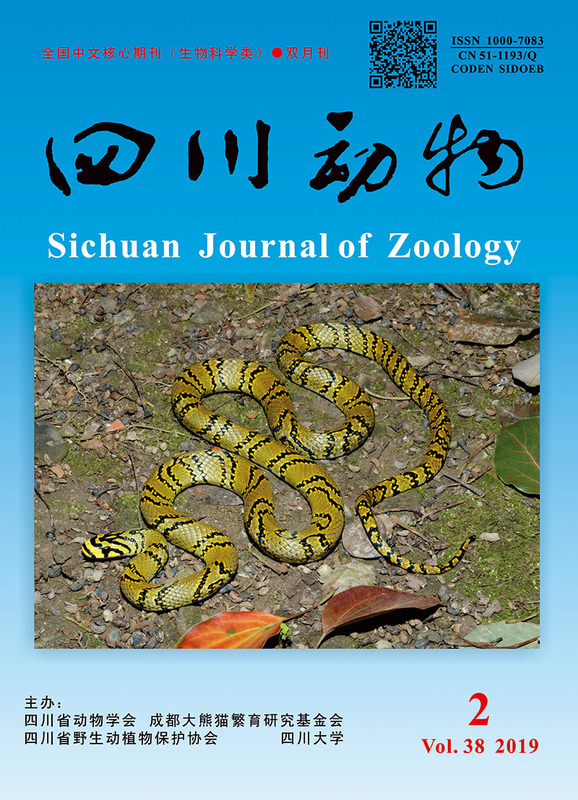 Breeding ecology of the Emei Shan liocichla (Liocichla omeiensis)[J]. Wilson Journal of Ornithology, 123(4):748-754. Gill FB. 2007. Ornithology third edition[M]. New York:W. H. Freeman. Hegyi G, Garamszegi LZ. 2011. Using information theory as a substitute for stepwise regression in ecology and behavior[J]. Behavioral Ecology & Sociobiology, 65(1):69-76. Hoover JP, Brittingham MC. 1998. Nest-site selection and nesting success of wood thrushes[J]. Wilson Bulletin, 110(3):375-383. Kulesza G. 1990. An analysis of clutch-size in new world passerine birds[J]. Ibis, 132:207-422. Lu X, Yu TL, Liang W, et al. 2010. Comparative breeding ecology of two white-bellied redstart populations at different altitudes[J]. Journal of Field Ornithology, 81(2):167-175. Lu X. 2005. Reproductive ecology of blackbirds (Turdus merula maximus) in a high-altitude location, Tibet[J]. Journal of Ornithology, 146(1):72-78. Lu X. 2008. Breeding ecology of an old world high-altitude warbler, Phylloscopus affinis[J]. Journal of Ornithology, 149(1):41-47. Luc B, Laurent C, Vincent B, et al. 2008. Multi-scale selection and foraging ecology of the eurasian hoopoe (Upupa epops) in pine plantations[J]. Biodiversity and Conservation, 17(5):1073-1087. Mayfield HF. 1961. Nesting success calculated from exposure[J]. Wilson Bulletin, 73(3):255-261. Mayfield HF. 1975. Suggestions for calculating nest success[J]. Wilson Bulletin, 87(4):456-466. Wang J, Jia CX, Tang SH, et al. 2011. Breeding biology of the snowy-cheeked laughingthrush (Garrulax sukatschewi)[J]. Wilson Journal of Ornithology, 123(1):146-150.